This is the fourth of 20 volumes of the Penguin English Journeys series. I plan to read all 20 in the month of April. 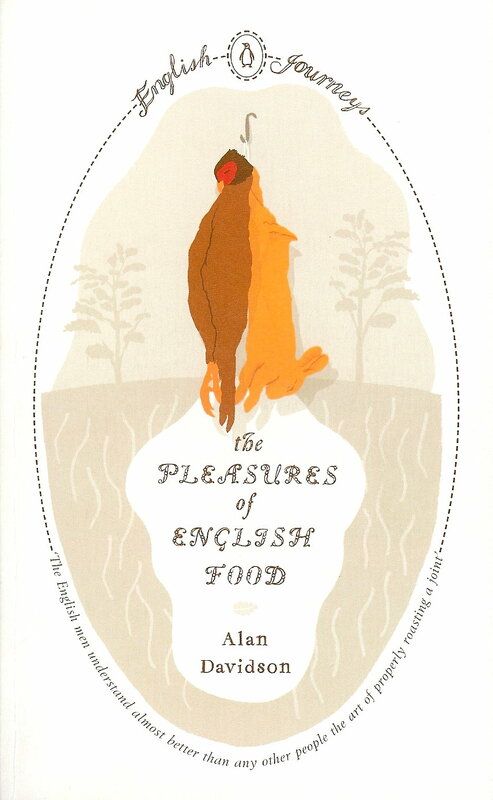 Written by the author of The Penguin Companion to Food, this volume is a wonderful little primer on English cooking. Organized in alphabetical order like an encyclopedia, The Pleasure of English Food covers the highlights of English food from Afternoon Tea to Yorkshire Pudding. I realize as I write this how seemingly predictable the first and last entries are. Aside from Fish and Chips, I would hazard to guess that Afternoon Tea and Yorkshire Pudding are probably the two most obvious choices that most Americans would reference if asked about English food. But fear not there are just as many non-obvious entries as there are obvious ones. Beeton, Isabella: (1836-65)…was only 25 when her work appeared in book form and only 28 when she died. […] Given that her book merits such high praise it is all the more unfortunate that [her husband] Sam Beeton ran into financial difficulties…[and] relinquished all his copyrights…from then on it was downhill all the way until eventually, by the 1960s, the revised book did not contain a single recipe written by the author. Fruitcake: …Making a rich fruit cake in an 18th-century kitchen was a major undertaking. The ingredients had to be carefully prepared. Fruit was washed, dried, and stoned if necessary; sugar, cut from loaves, had to be pounded and sieved; butter washed in water and rinsed in rosewater. Eggs were beaten for a long time, half an hour being comonly directed. Yeast, or ‘barm’ from fermenting beer, had to be coaxed into life Finally the cook had to cope with the temperamental wood-fired baking ovens of that time. Gooseberry: …In 1905 a mildew disease was accidentally introduced from America, wiping out the whole crop of European gooseberries. The plant was re-established by crossing American species resistant to mildew, but the gooseberry has never fully regained its earlier popularlity. Although one discovers later in the book that Cottage Pie is made from beef, Shepherd’s Pie is made with lamb or mutton. that we used to say this as kids (except it was ‘pease porridge’) but I have no idea why. In fact, it wasn’t until I was an adult that I knew what pease porridge was, so why in the world did a bunch of German-Polish American mutts in central Minnesota even know this rhyme? The regional varieties of British sausage described has me wanting to do a Sausage tour of England so I can taste the flavor variations. And recently Verity at the B Files blogged about baking Simnel Cakes. Thanks to this little book I now know what they are. And oddly enough the cakes were originally linked to Mothering Sunday which the book goes on to explain in much the same way I did in this blog back on Mothering Sunday. I wish there had been an entry for Fish Pie. I have always been fascinated by the notion of a fish pie since I first heard it used in the film “A Room With A View”. Towards the end Mrs. Honeychurch is urging them to hurry because cook Mary has made fish pie and everyone knows how Mary gets if her fish pie is spoiled. Oh, well, I guess I could just look up the recipe. As an Anglophile who loves to cook, I loved this book. But anyone who reads English fiction will appreciate the explanations of historical foodways that pop up here and there in older English novels. Next up: Through England on a Side-Saddle by Celia Fiennes. Sounds like you're having way too much fun with this series Thomas. I'm thinking of buying the set for my mother-in-law and then “borrowing” them from her. Too bad about gooseberries not being any longer so popular. They are delicious in pies and fools. And about the tree thinning: my English tree guy who is passionate on the subject says that “forest management” has been a huge priority for the English for almost a thousand years. Thanks for mentioning my Simnel cake! Sorry – I should have explained what one was when I made it!! This book sounds fascinating and I'm intrigued to find out more about what are considered English gems. I am going to have to pull this one out when I get home tonight! I would suggest that a Sunday roast is also quite an English food of which Yorkshire pudding is one. Your review of this one reminded me of Kitchen Essays (a Persephone book). I enjoyed that one a lot and it covered several dishes unknown to me. Looks like you are enjoying the series. Well, except for the “Wen will it end” reference. I'm very much enjoying your reviews on the Penguin English Journeys series. This volume sounds delightful. Those little titbits you gave are so interesting – fancy washing butter in rosewater! I love the covers of these books. I want to have them all. Sounds like an interesting book. I love those interesting factoids about English food. And I remember that little rhyme too. I love reading about food in books, especially 'old' food which gives a great historical insight. I've been meaning to read Beeton's 'Household Management' book. I never knew she died so young. Mlle: Maybe we need to find an English tree guy. Verity: I meant to look up Simnel cake when I read your post, but never did, so it was really nice to come across it in this book. Ti: I have shied away from the Persephone Kitchen Essays, but now that I have read this I think I am much more inclined to give it a go. Skirmish of Wit: I know the butter and rosewater part really threw me. I wonder what the reason could be. Rose City: Of course I judged them by their covers–that's what prompted me to buy them. Mrs B: After years of reading British lit, it cleared up some vagueness and misunderstandings in my comprehension of certain food items. Mad Bibiliophile: I have a Mrs Bridges Cookbook that has Upstairs as well as Downstairs recipes that is similarly interesting. Every Book and Cranny: You know I hvae never read that story. I will have to check it out. Desparate Reader: I am realling looking forward to the Jeykll. She is one of my husband's favorites.